I almost can't believe this is my first post in more than a year. I post glyphs just recently, and it was the first time in three months. So I thought I'd round out 2015 looking back over the last year in warcraft, gold making and how my playtime has changed. Firstly, I have really enjoyed the Warlords expansion. The change to flex raiding had easily as many downsides as it had upsides, but the raids we a great deal of fun. One of the most difficult parts of raid leading in 10 man heroic content was telling people they weren't required when we had too many, and cancelling raids when we didn't have enough. However, there were large chunks of Cataclysm and Mists that we weren't actively recruiting! How satisfying and relaxing those stretches were. In Warlords, we are always recruiting, and never had a team that approaches enough for Mythic raiding. The flex raiding system had some pretty awful scaling problems despite learning the lessons from late Mists. Bosses being objectively far easier with more people is pretty depressing for a small guild at times. The flex system also encourages people to be far more relaxed with attendance and punctuality, another double edged sword. On one hand, it's fantastic that a raider in a different time zone doesn't have to adopt an all or nothing approach towards raiding… on the other, it's easier for people slip into the part-time raider role which causes some issues with everything from roster strength to loot distribution. Overall though, I've had a great time with the guild, raiding, and met some great people to share it all with. As for gold making, there were many factors that led to a large decline in my activities. I'll try and look at these in order of significance from most to least. Warlords professions and the garrison grind. I used to feel like my fleet of alts were all a part of a giant enterprise. Twitchie Enterprises to be exact. Each alt had skills in their own right (professions) and responsibilities that contributed to the whole, awesome machine. When our realm got connected, I even created a small fleet of gnome warlocks to handle the glyph posting operation and other miscellany (like the Jeeves market). In Warlords, with everything being tied to heavily to the garrison, my alts all feel like they have jobs. Log in, do cooldowns, garrison chores, log out. Repeat. I rarely did much gathering out in the world, but having a mine in the garrison felt almost nauseating. Rather than creating valuable items and selling them to other players (with competition from other players (which makes gold making on the Auction House a multi-player game)), I'd look for gold missions and click a button. Ewww. Recruiting and rerolling to maximise my gold on a couple of toons held my attention for a minute, but not longer. I mean, who can say no to gold at the click of a button? Well, me, it turns out. I burnt out on the fun of garrison chores reasonably quickly, and surprised myself at just how many topped out garrison resource caches I was collecting. Having both daily cooldowns AND profession buildings was just too much and at some point a switch flipped on my fun console. Lifestyle. I'm playing video games a lot less. It used to be that my lifestyle was organised around my business and warcraft. Working where I live was a great asset for gold making, and being relatively isolated from family and friends a fantastic outlet for social interaction. Any downtime I had, I would spend on the Auction House, so I could grab bargains at any time of day, and set up some prolonged AFK crafting. Don't get me wrong, that's still very casual by many gold makers standards… but at some point priorities shift. For example, at some point I started skipping breakfast in favour of a morning coffee and posting auctions. Now, I use that time to make my wife and I a delicious breakfast. Porridge with pear and walnuts? An omelette with wilted baby spinach, olives and parmesan? Yes, please. Our work generally happens in several phases. It used to be phase 1, break and post auctions, phase 2, and fit phase 3 in while dealing with phase 4. Now, I head down, power through phase 1, directly into phase 3, into phase 2 before lunch. Giving me more time for administrative tasks later in the day, and heaven forbid one of us might get to work on a longer term project while the other is 'on-call' for phase 4. It has made a huge difference to my productivity and stress levels, but it is rare that I'm gaming before the afternoon. I also used to try and cram in auctions before we left for a business trip or a day out… now I no longer feel compelled to keep up a routine, and almost all of my other passions happily have a higher priority that making gold. Other games. Talking about switches on the console of fun? Hearthstone! Heroes of the Storm! I even finally caved and bought the whole Starcraft 2 saga! 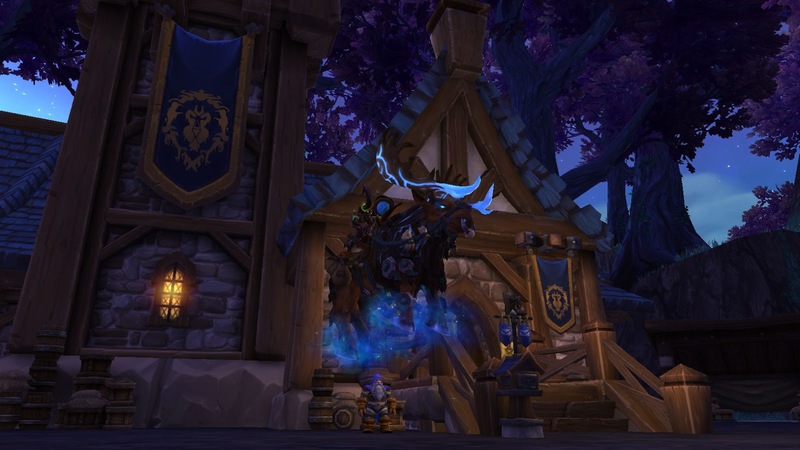 If I have a free half hour, logging from toon to toon to perform garrison chores just isn't exciting as playing a game that is new and fresh and has plenty to explore. Unfortunately for those other games, they are more or less uninterruptable, which is the major benefit of gold making in Warcraft. If I had uninterruptable time when guildies were on, I'd love to get in and do a challenge mode dungeon (something severely lacking in my playtime in Warlords). I still haven't finished off Doom 3, and the new one is almost out! Legendary ring, and content for alts. I think this one is pretty minor as far as gold making goes, but it is a factor. One of my main motivations for making gold is that I really enjoyed the process of gearing up alts and getting them raiding. LFR killed this to some extent, but probably only as much as just playing a lot less in general. In BC, when I finally leveled an alt and got them into raiding (I was playing a lot less back then too), I could craft some awesome gear, buy some great BoEs and run heroics for some badges. I really enjoyed the attunement system, and trekked through it like the epic quest it was. In a short amount of time, I could get great gear and perform well in content people were still doing, and then move up to the next level of content. Those were the days. Now, everything is a giant grind with a capital G. Complain about attunements? You only had to do that once! The time investment and repetitive nature of the legendary quest line just turns me off completely. So much so, in Mists I only completed the legendary cloak 4 times… and in Warlords, none of my alts have finished it. As an aside, only two of my alts even have a shipyard… but I digress. I used to enjoy getting my characters up to max level, and playing them intensively, all the while showering them with expensive presents to watch their power grow. I really liked working my way through the previous raid tiers quickly and picking up the odd upgrade along the way. Now, each step of the legendary questline is so repetitive and tedious, it's all I can do to think about the most efficient way to dredge the lake of free catch up gear before I put that alt away. Lastly, having 5+ million gold (and WoW tokens). At some point, watching the graph of gold acquired go up and up loses its charm. I think 5 million was that mark for me. There are still plenty of gold sinks I haven't indulged in, and there's always the ever more expensive WoW tokens to buy… but I think I'm not as interested in trying to outpace my spending with earning more gold. So far, I'm up to 375k spent on WoW tokens and while I can play for 'free' (time is money, friend) for a long time to come, earning against that gold sink takes a little bit of fun out of gold making. So that explains where I'm at with gold making, and this blog. I'm very much looking forward to Legion and hoping that it renews my interest in all things gold. I might even resurrect some of the more interesting and analytical posts I was working on before I disappeared, but no promises there. I'll finish with some of the things I've spent gold on in 2015. 100k in reputation tokens… because… well… time is money, friend. ?? ?k in heirlooms… because they got lost in the mail. 40k for the consortium pet(s), because it's about damn time. Then a whole bunch for various BoEs, crafted upgrades, and some transmog items from the Black Market Auction House. I'm a little surprised that my total spend (just items that I bothered to note (e.g., not consumables, gems, chants etc.)) was less than a million gold for 2015. Surprised even more, that despite spending over 600k in December 2014 alone, Warlords will be the first expansion my gold total will decrease, and I'm happily sitting below 5 million gold going into 2016. I hope everyone is looking forward to a happy and prosperous 2016, and are as excited as I am for Legion! How did you all fare in 2015?